Embossing refers to the creation of an impression of some kind of design, decoration, lettering or pattern on another surface like paper, cloth, metal and even leather, to make a relief. In regular printing or an engraving, plates are pressed against the surface to leave an imprint. In embossing however, the pressing raises the surfaces adding a new dimension to the object. 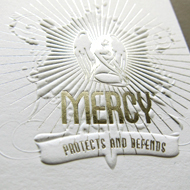 Embossing is an elegant process that changes the nature of the material that has been embossed. More often than not it elevates the standard and quality of the product.